Leavitt Meadows and the West Walker River: This is one great area--now part of the Hoover Wilderness as of 2010 and just amazing scenery. Plus, the permits are available on a self-serve basis at the trailhead! We worked our way up the West Walker River trail, then forded the river (in early July of 2010 this was no laughing matter!) and climbed up to Fremont Lake. From there we went through Walker Meadows and then camped at Cinko Lake. It won't have this much snow when you get here---we were the first people into the lake this year--and that was over 4th of July weekend. And then past Cinko Lake, along the Pacific Crest Trail to Cascade Creek...down the creek to the West Walker again, and up into Long Canyon. ( If you wanted, you could also take the PCT up to Harriet Lake and beyond. over Dorothy Lake Pass into Yosemite.) The photo at right is lovely Stella Lake, on the way to Dorothy Lake Pass. 35+ miles. The next trailhead south is Buckeye Creek. We took this trail over 4th of July weekend in 2017, when the rivers were roaring and the high country was buried in snow. We had a plan. Since the canyon starts just over 7100 feet, snow wouldn't be an issue. But the trail crosses Buckeye Creek a couple of times going up the valley, and the first time the water was over our waist, and moving pretty fast. We chickened out. Instead, we decided to see how far we could get by hiking up the south side without a trail. We even hoped that we might make it to where the trail crossed back. Twin Lakes to Benson Lake and Matterhorn Canyon is a longer hike--we took seven days to finish the 50 miles. And it leaves from Twin Lakes Road off Highway 395. This one has it all: stunning vistas, wonderful fishing, great lakes, and just a little too much traffic to be on our all time favorite list. But you owe it to yourself once in this life to walk up Matterhorn Canyon towards the Sawtooth Range...seen in the photo below right, or stumble down wide-open Kerrick Canyon, trying to turn your head as you walk to take it all in. And when you add in the wonderful fishing in Smedberg Lake for rainbows, and Matterhorn Canyon for brookies...well, it's a great trip. That's Robinson Lake above. The first pass is over 11,000 feet, and you then drop down past Summit Lake into Virginia Canyon. Here is where the volcanic geology of the east side of the Sierra gives way to the more traditional granite of the south and west--and the contrast can be striking. That's Shepherd's Crest at left, on the way to McCabe Lakes. It's part of the Mt. 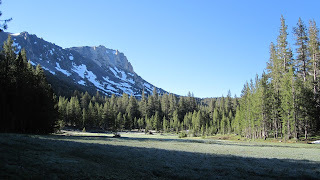 Conness range that towers over the northern side of Tuolumne Meadows. completely bowled us over. In the photo below right, M is just getting packed up in front of Virginia peak on a ridge above Return Lake. That's off-trail a mile or two, but well worth the time and trouble to get there. This is a tough trail---the hike over Virginia Lakes Pass is no cakewalk, and unless you can leave a second car at Green Lakes, you will need to hike it twice. We did. And we thought this area was well worth the effort. One of our favorite hikes in Yosemite. Mono Lake. It's the old trail that the Paiute and Mono Indians used to get up and over the crest from Mono Lake into Yosemite Valley. And it is unrelenting steep. But it is also short, and has wonderful views. The trailhead is the Walker Lake trailhead off the June Lake Loop Road, and permits come from the Mono Lake Visitors Center. You park on top of a ridge to the south of Walker Lake, and then drop down into the canyon. The rest of the climb is a series of steep switchbacks up steep canyon walls, with an occasion respite where you can catch your breath. There are nice old mining structures here, beautiful views, and lots of little brook trout in the lakes. A good short trip when you have a free weekend, and want to do something really nice. Thousand Island Lake and the John Muir Trail South: this is the very best part of the JMT, and you can reach via different trailheads. 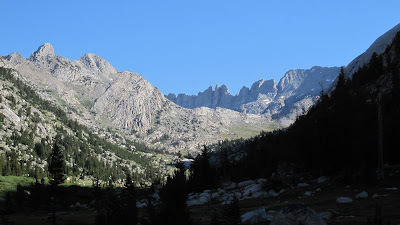 We've hiked up Rush Creek, in the June Lake area of Highway 395, and then explored all of the stunning vistas of the highest peaks in the Northern Sierra Banner, Ritter, and the Minarets. Day four took us down into the canyon of the San Joaquin River, and then up to Agnew Pass and the small but charming Clark Lakes. And the last day went up over the pass to Spooky Meadow (there is supposed to be a ghost there!) and then down down down the canyon all the way to Rush Creek Trailhead again. Here is the trip report: thousandislandlakeandmore But there is no need to follow our route, just about anything works in this area--and everywhere you will see those peaks looming over you! This is not the same Mono Pass as above...this one is between Mammoth and Bishop, and includes a trailhead to Little Lakes Valley as well. It's a good steep climb over Mono Pass (12,000+ feet) but the trailhead lets you start around 10,000, so it's not too bad. The pass itself is not the highlight--it's the area beyond, where you can really see some wonderful country. We camped at Fourth Recess Lake and were enchanted with the 800 foot cascade that feeds it. And we explored Pioneer Basin (named for the business moguls of early California: Huntington, Crocker, Stanford and Hopkins). The Basin is like a huge garden with lovely ponds in all directions, and small trees among the rocks. But beware: in inclement weather this area is very exposed, and you are better off camping lower down in the canyon. The canyon, by the way, connects down to Lake Thomas Edison where we took another trip up beyond Second Recess...and loved it as well. Little Lakes Valley: Leaving from the same trailhead as above, you can follow this trail for four miles up towards Morgan Pass, hiking past more lakes than you can count. Each one has a slightly different combination of fish in it, and the area gets a lot of day hike traffic for that reason alone. But you can find a few quiet spots in out of the way places, and this would make an ideal first backpacking trip for kids. You could stop pretty much anywhere you want and find a campsite, and kids and water entertain each other just fine. And it has the added advantage that if things really do go bad, you are only an hour or two from the car, no matter where you decide to camp. You can see a few of the many lakes in this valley in the photo at left. And you can also see that the terrain is reasonably flat, making the hikes less challenging than the nearby Mono Pass area. but insistently for the first mile up to the junction with the trail the Grass Lake (if you ever wanted to avoid a lake in mosquito season, this would be the lake!) But once past that junction it is steep, rocky and rough. The good news is that it is also short. It's less than a mile to the Lower Lamarck Lake, and only 1.6 miles to Upper Lamarck Lake. We'd suggest camping at the lower lake, as the upper one has very few good sites. 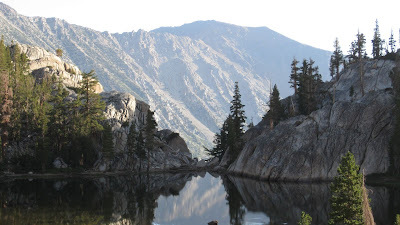 But from the upper lake you can take the trail up over Lamarck Col to Darwin Canyon and Kings Canyon National Park. That's an e-ticket ride, and it should be on everyone's list of hikes they want to do some day! and the good news is that if you choose to do it, you can connect to the Lamarck Col trail and make a loop. It's a nice trip to do if you have five or more days to enjoy it. But Humphrey's Basin is also a wonderful place to set up a base camp and explore for days on end. Each of the lakes in this area seems to have trout, and most of them get very little fishing pressure. You can explore for a day or a week and always find something new. While the upper lakes like Goethe and Desolation are quite austere, the Golden Trout Lakes have more trees. And more people. Still, this is a top-flight destination. It's only about 7 miles from the trailhead at 9,350 over Paiute Pass (at 11,440) and then back down into the basin to some decent campsites below 11,000 feet. And the hike itself passes through Loch Leven and Paiute Lake for added scenic pleasure. A really nice place to spend a few days. That's Upper Golden Trout Lake in the twilight, at left. Want more photos? Saddlerock Lake....and If you are ambitious, over Bishop Pass to Dusy Basin and beyond. Or you can explore the other lakes in this wonderful basin: Treasure Lakes, Chocolate Lakes (mmm!) Ruwau and Bull Lakes...lots of stuff to see and do here. And while the trails are often steep, the distances are also short. A few miles takes you from one end to the other. A lovely, lovely area.